Based on true events, 21 is an entertaining drama examining what happens when the glitter and seductiveness of the Las Vegas gambling world are used as ill-conceived shortcuts on the road of real life. 21 is based on the events described in the book Bringing Down The House, by Ben Mezrich. The movie was accused of white-washing what in reality was a predominantly Asian-American Blackjack Team. While the decision to cast white actors in all the leading roles is understandable from the perspective of increasing the film's marketability, it is a sad statement on society that actor ethnicity remains a major factor in determining commercial success. Ben Campbell (Jim Sturgess) is a student at MIT, a math wizard, and looking to get into Harvard Medical School. He is recruited by one of his professors, Micky Rosa (Kevin Spacey), to join the Blackjack Team: a group of students organized by Rosa to use a card-counting system and win big at Blackjack during weekend trips to Las Vegas casinos. 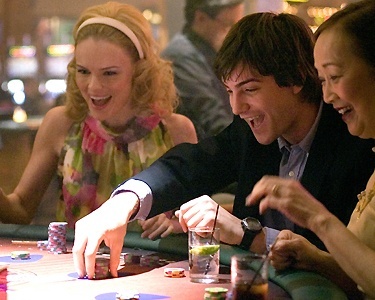 At first reluctant but seduced by the idea of making enough money to pay for medical school, Campbell joins the team, falls in love with team-member Jill Taylor (Kate Bosworth), and over 17 glitzy Vegas weekends makes more money than he ever imagined possible. He enjoys the fast and loose life style of the big-time winning gambler, but things start to fall apart when he loses his friends at MIT; tensions erupt between the Blackjack Team members; and Cole Williams (Laurence Fishburne), a burly Vegas security chief with a mean streak, smells something wrong with Campbell's unlikely winning streak. Director Robert Luketic ensures that 21 looks great, whether in luxury-drenched Vegas or the more staid and academic Boston environment. Kevin Spacey keeps his balance walking the fine line between smiling math professor and conniving blackjack strategist, alternating between charming and badgering his students to win him money. Laurence Fishburne does not need to bother with the charming part, he just bulldozes his way to uncovering those who try to win at Blackjack by counting. Jim Sturgess and Kate Bosworth are an appealing mix of student naivete and young adults forced to deal with the challenges of an alternate world. Slick, engaging and thought-provoking, 21 doesn't bring down the house, but it does shake it up.